More troubling developments in Tibet today as Chinese troops pour across the countryside, turning small villages into armed bases. Many kudos to Nancy Pelosi, the House speaker from California. She traveled to Dharmsala, India, to show solidarity with His Holiness the Dalai Lama and the Tibetan refugees living there since 1959. She was leading a Congressional delegation. "If freedom loving people throughout the world do not speak out against China's oppression in China and Tibet, we have lost all moral authority to speak on behalf of human rights anywhere in the world," Pelosi said before a cheering crowd of thousands. 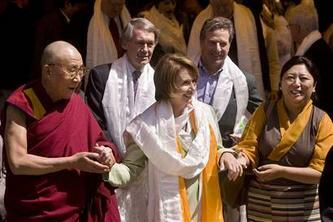 His Holiness gave Ms. Pelosi a gold kata, or scarf. His traditional greeting to people of honor is to give them a white kata, so his gift shows the heightened level of feelings during the crisis. Chinese authorities have categorized the protests, largely by Buddhist monks, as "violent." From what I am reading, the "violence" committed by Tibetans was to throw rocks at police. The monesteries at Sera and Drepung are shuttered. Drepung monks have a center in Atlanta, and were key hosts during the visit by His Holiness in October. They also perform the "Mystical Arts of Tibet" dances, music and sacred chanting. If you would like to know more about their beautiful music, listen to the Sera monks here. Hooray for Nancy Pelosi! This is what all of America's leaders and citizens should do: Speak out in support of Tibet. Thanks to you for using your blog to increase awareness of the situation.